English sculptor, draughtsman, and designer, an outstanding figure of the Neoclassical movement. He was the son of a moulder of plaster figures, and after studying at the Royal Academy School (where he met his life-long friend Blake) he worked for the potter Josiah Wedgwood from 1775 to 1787. The designs he produced for Wedgwood not only strengthened his interest in antique art but also developed the innate sensitivity to line that was his greatest gift. At the same time he gradually built up a practice as a sculptor. In 1787 he went to Rome to direct the Wedgwood studio and stayed for seven years. While there he drew his illustrations, much influenced by Greek vase painting, to the Iliad and the Odyssey, engraved and published in Rome in 1793, followed by illustrations to Aeschylus (1795) and Dante (1802). These engravings, which are of exceptional purity of outline, were republished in several editions, and won him international fame. 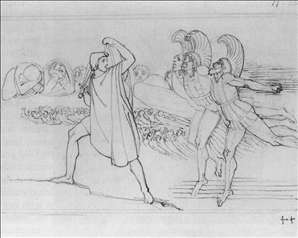 His later illustrations to Hesiod (1817) were engraved by Blake. He returned to England in 1794 with a well-established reputation and immediately became a busy sculptor. His monument to the poet William Collins (Chichester Cathedral, 1795) and the more important one to Lord Mansfield (Westminster Abbey, 1795-1801) were commissioned while he was in Rome. 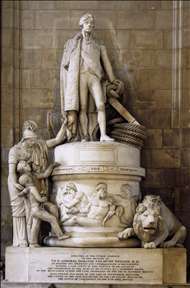 His enormous practice as a maker of monuments included large groups with freestanding figures (Lord Nelson, St Paul s Cathedral, 1809), but his most characteristic work appears in simpler and smaller monuments, sometimes cut in low relief. In these his great gift for linear design was given full play. 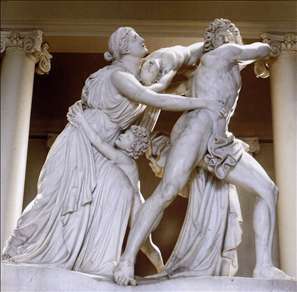 Flaxman was appointed the first Professor of Sculpture at the Royal Academy in 1810 and his reputation among Neoclassical sculptors was exceeded only by those of Canova and possibly Thorvaldsen. He was one of the first English artists to be famous outside his own country, although his reputation and influence were based principally on engravings after his drawings rather than his sculpture. University College London has a large collection of Flaxman s drawings and models, and examples of his monuments can be seen in churches throughout England. See more details about "The Fury of Athamas"
See more details about "Monument to Vice-Admiral Horatio Nelson"
See more details about "Odysseus in the Underworld"
See more details about "The Fight for the Body of Patroclus"